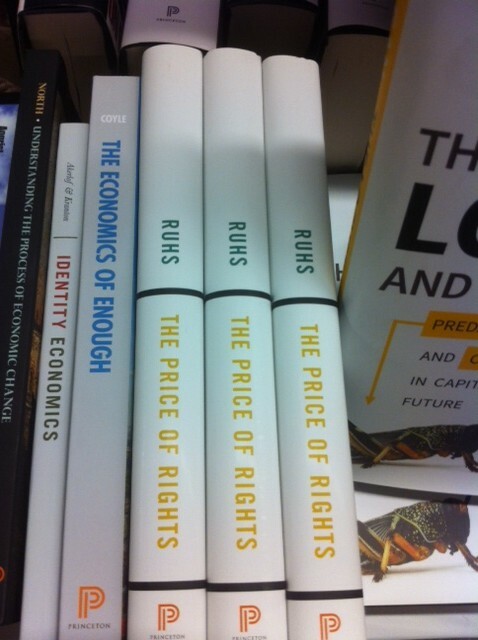 My The Economics of Enough has been out for a good while, and I’m soon due to be proofreading my next one. But Martin’s book The Price of Rights: Regulating International Labor Migration is brand new. I think it will be a must for people interested in the migration issue. It looks at the restrictions high-income countries place on inward migration and the trade-offs between migrant workers’ labour rights and their access to labour markets. I’m going to read it alongside another new book in my in-pile, on an important historical episode in the history of international migration, when the scale of cross-border labour movements rivalled those in the current episode of globalization, Drew Keeling’s The Business of Transatlantic Migration between Europe and the United States, 1900-1914. Intriguingly, it promises to look at the role mass migration played in the development of the travel business. There have been quite a few books on migration recently. One well worth reading is Exceptional People: How Migration Shaped Our World and Will Define Our Future by Ian Goldin et al. One I must also read is Paul Collier’s Exodus: How Migration is Changing Our World – Dalibor Rohac reviews it here, very favourably albeit with a slight caveat about wishing it had looked more at the evidence on the untapped economic gains from less restricted migration. I haven’t bothered with David Goodhart’s The British Dream – it’s evidently political polemic rather than social science. This is very nerdy of me, but the OECD’s annual International Migration Outlook is always worth looking at it for actual data and analysis. This entry was posted in Main Page and tagged migration by Diane Coyle. Bookmark the permalink.